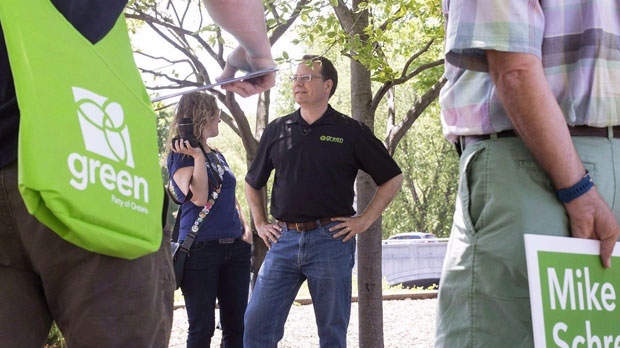 TORONTO -- Ontario's Green party has won its first-ever seat in the legislature with leader Mike Schreiner handily beating out his rivals. Schreiner won by a comfortable margin in his Guelph riding. The American-born politician moved to Canada in 1994 and became leader of the provincial Greens 15 years later. In the 2014 election, Schreiner finished third with 19.29 per cent of the vote -- less than two per cent behind the Progressive Conservative candidate and ahead of the NDP. And this time, it was clear Schreiner had a shot at making history with recent polls suggesting he was in the lead. He was competing for the former seat of prominent Liberal Liz Sandals, who had decided not to run again.